Featured Partner: Game It Inc.
No playing for virtual livestock or wizard coins here! 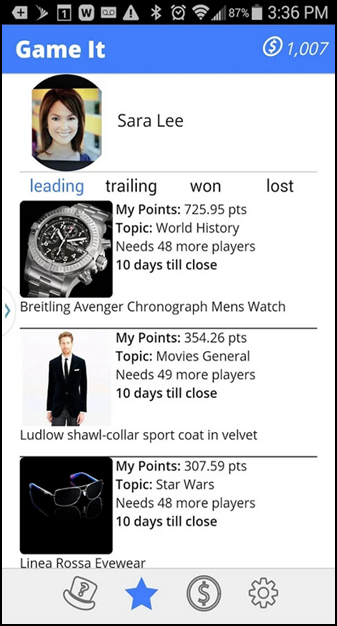 Game It is an exciting new social shopping quiz game that awards real and popular products to winners every day! 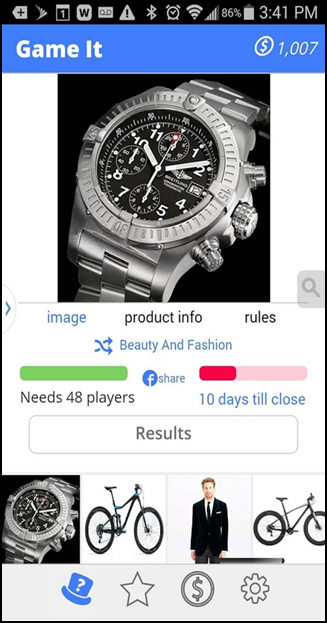 Unlike other quiz apps you have played, you compete against other players to win desirable products ranging in value from range from $10 to well, there is no limit. Prizes include items from top brands such as Lululemon, Kate Spade, GoPro, Pottery Barn Kids, Cartier, and Sorel! Your random knowledge of geography, pop culture, science, and sports can finally pay off in a big way! Find It. Game It. Win It. Scroll through Game It’s wide variety of awesome merchandise until you locate that perfect prize. If a prize catches your eye, check out the quiz category, and fire up your brain! After you find that perfect prize, select “Play to Win” and shoot for the highest score! Contribute the virtual currency indicated for the trivia contest and answer 10 trivia questions quickly and correctly to boost your point total. Not happy with your performance? Not to worry, you have options to grab the lead! You may attempt to steal points from the leader in order to gain the lead. When you steal successfully, the person you stole from gets your coins used to gain the lead, and you gain the lead. The steal can happen to anyone at any time during the open duration of each applicable quiz, so be on your guard and strategically make your moves to end up in the lead at the close of the applicable quiz. Once you enter you can continue to attempt the quiz and increase your score for additional virtual currency. Share the quiz game with your friends to ensure enough players participate and the prize can be won! If you’re still in the top spot by the game’s end, you win! Your prize will be shipped directly to you! Game It requires Android 2.3.3 and up. The quiz game is also compatible with iPhone, iPad, and iPod touch, requiring iOS 7.1 or later. Download from the App Store or Google Play now and GAME IT!